Few decades back in Indian household it was a common thing that Men will do job and women will take care of daily household chores. But with time things changed , women started taking technical education , they were more willing to do a job than simply sitting at home and doing cooking & cleaning. With the change in this system the work load on women also increased as there are no mother-in- law or sister-in-law who can give help in any way . Thus the work load on women got increased many fold with a Home maker becoming Super Women and doing multi tasking to maintain her daily house hold chores as well her professional commitment (if any ). Cooking , cleaning , washing , teaching her kids every thing comes under a Women’s domain with she responsible for every thing , If clothes are not washed , dried and Ironed then everyone including the kids would ask their mom about it , no body asks their dad about clothes , food or home work . The reason every one thinks that all this is a women’s work . At my home also this was the scene , we never asked our father for anything , it was always Mummy who was responsible for our food , lunch boxes , clothes , etc. Very rarely my father use to help my mom in house hold chores . But now things have changed , Men have become more responsible and sensible . My brother and my husband both really Share the load of a Women’s work at their home . My brother cooks food sometimes when he is free , usually during weekends so that my mom gets some free time and rest . Sometimes my husband also cooks during holidays so that I can get some free time and do some other work or simply can take some rest from my hectic schedule . Regarding Laundry I have a washing machine at home and I usually do laundry work , but my husband also does some laundry work just to help me . Specially he prefers washing his own clothes in his own way. Coloured clothes in a separate wash , daily wear in a separate wash and so on . Even if I say I will do , he says he can do this much #ToShareMyLoad . And I just love this gesture of his , its really great to see Indian Men or an Indian Husband thinking so much of about his wife . When I am ill he does everything starting from cooking , washing clothes and taking care of kids. In fact during weekends he wants to cook something different so that I can get a day break from cooking. And we can spend more quality time together rather than me indulged in endless works at home. My kids have learned good things from their dad then when somebody is ill we should take care of them and allow them to have rest and let them get well soon. Thus this sharing the load concept is bringing a positive change in the society by men becoming more responsible towards their family and women getting more time to dedicate to their carrier along with being a dutiful wife and a caring mother or we can say a perfect homemaker . This also helps to maintain work life balance for both the partners. We need to teach men to share a Women’ load of house hold work and daily chores as when a husband and wife both are sharing the load of earning money , then they should also share the load in household chores . Now a days because of change in economy and high standard of living it is quite difficult to run a household with single income , so wives do step out of the house to help their husbands to have a decent monthly income. But she has to manage both home and her job. In such situations it is very much required that husband should also help them in their daily house hold chores , It develops a strong bond of Love and affection between spouses as wife feels that her husband is caring for her. It also helps to teach our kids and younger generation that men should share the load of their mom or wives in daily house hold chores and since children are great imitators they would imitate and learn some good thing . 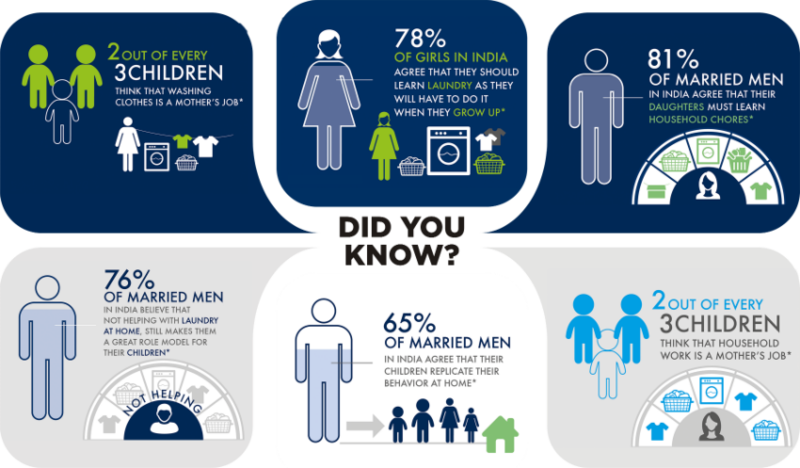 This survey shows what people think and collective opinion shows doing any household chore specially laundry is a women’s job . Ariel has started a Wonderful Campaign called #ShareTheLoad Which would definitely help to change the existing system where a women is responsible for all house hold chores .